Not so long ago, at a party not so far away I was caught without a bottle opener and no one seemed to know where one was. So, I tried to be a smart Alec by prising the bottle top off on a table surface, I dug a huge chunk out my friends furniture and nearly sliced my hand off. 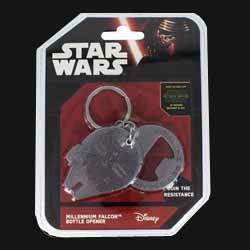 If only I'd owned this Millennium Falcon Bottle Opener at the time... I'd probably be allowed round their house today without them pointing at their ruined furniture and reminding me what an idiot I was. 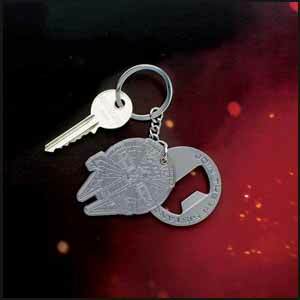 There are a number of Millennium Falcon bottle openers on the market and this is the simplest of the lot - meaning it's the most practical and therefore the most useful. It's constructed of two pieces of metal. The opener part folds behind the etched Falcon. When you need to use it you simply twist it to revel the bottle opener. It can be twisted either side depending on whether you're left or right handed. While it's not as impressive in its design as other versions, it all boils down to whether you want a die cast replica that also acts as a bottle opener, or whether you want a functional bottle opener that offers a stripped down version of the Millennium Falcon. Personally, if I wanted a collectible miniature that's what I'd buy. I'd rather have a functioning bottle opener like we have here. This is a practical item that means you don't have to use much force (geddit?) to prise the top off your bottle.